This past fortnight has been all about things in miniature. Firstly, I was fortunate enough to track down Kate Johnstone and her miniature sculpture of Blakemoorgate cottage which is now on display in my residency area. I am using it to inspire my setting; my off grid living conditions of my heroine Jessamine and her father Geraint ‘Rommel’ Wood. Secondly, I’ve been involved in this year’s Shrewsbury Bookfest. I’ve been collaborating with illustrator and children’s author Meg Hawkins on a book we have created called the ‘The Fox that Rocks’ – a story of my Foxy wanting to be part of the band. 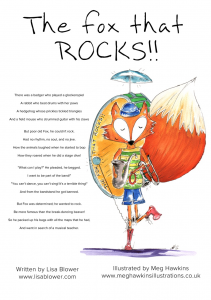 We tested the words & images on two groups of primary school children with a workshop that asked them to add to the story: where did Fox go in the world to learn a musical instrument from the masters of that instrument? From African thumb pianos to Chinese Zithers, the kids and Fox went global and came up with the most wonderful poems of Pandas in Peru playing Piccolos; of Chaos the bongo-playing rabbit; of hamsters in Hawaii that strummed on ukuleles. Meg and I then set up stall in the Shrewsbury Square where a celebration of all things Julia Donaldson invited more poems of pets teaching Fox to rock. Amazing what a young creative mind can invent within four lines on a rain drenched Saturday. Poets and stories in miniature; sometimes they can be the most inspiring to us all. In 1865, the Rev Donald Carr was found wandering in deep snow on the lower ravines of the Mynd. He had been missing for over twenty two hours. When found, by a pack of collies rounding up the sheep, he was snow-choked and mad with cold. Although his burst wrecks of boots remain on display in the Shrewsbury Museum alongside a battered memoir of his adventure, and although many still reference the Reverend’s struggle and nearly-death as epitomising life’s great journey, he is most remembered for being the bogeyman that rose out of the drifts and snatched the coats from the backs of the children who had dared to play in his way.